Hi there! Notice anything new? I know, I know, I let this blog just sit for a very long time, but it’s time to get it up and running again. If you’ve been with me for a while, you know I kind of bounced around on topics – animals, training, ghosts, conspiracies, gardening. Yikes! It was a mish-mash of everything I love, but I figured it was time to give my writing and blogging better focus and direction. I’ve given the blog a whole new look, and I’ve activated my Facebook Page – go ahead and give me a Like. Now, here goes. I hope you’ll stick with me. Serena Dracis is all about the paranormal. Supernatural. Spiritual. Whatever name or label you like, if it’s strange or unusual, I’m going to write about it. Hold on, it’s gonna get weird in here. But you like that, don’t you? I like how the apparition just casually walks right through the gate. And how appropriate is it that this spirit is walking away from the Haunted Mansion? Maybe it’s break time and the ghost is off to see other parts of the park? I used to work at Disneyland and heard about the ghosts supposed to haunt the Happiest Place on Earth during my two summers there back in the ’80’s. I never saw or heard anything personally but I heard about the ghost on Space Mountain that would open doors and the guy that died swimming from Tom Sawyer’s Island. Speaking of the Island, I always got a creepy vibe in those fake caves. If you loved the posts on dogs, training and gardening, check out my “sister” blog here. My new look and focus should make it much easier to find the posts you love. How about you? Do you love the paranormal? Have you had a ghostly encounter? Have you seen a UFO? Do you know there’s more to this life than what we see with just our eyes? You are definitely in the right place. Let me know what you’ve seen and experienced in the comments. I’m looking forward to hearing from you! Brrrr! It’s the depths of winter. We haven’t had snow yet in Seattle, but we have had cold, fog, and the ever-present rain. My garden is sleeping, buried in a warm bed of straw. It’s dark, cold and wet. We are chicks with ‘tude! Isn’t she gorgeous? You want chickens now, don’t you? Have you always had a secret desire to be an urban chicken farmer? Do you realize the benefits of raising your own food, even if it’s only in small quantities? If so, now is the time to start planning for your new flock, and I’m here to help. Before you go any farther, check with your local government, and familiarize yourself with the city codes concerning livestock. In Seattle, they recently upped the number of chickens you can have in the city from three to eight. Lucky me, I’m in an unincorporated zone where the only requirements are minimum square footage per animal. It’s also a good idea to have a friendly chat with your neighbors about your chicken plans. Usually, free eggs help ease any concerns, and you’ll likely have plenty to share. How many chickens should you have? Chickens are flock birds, so just one is not a good idea. She’ll be lonely, she may make extra noise trying to find friends. Two are okay, but they’ll constantly be vying for top bird status in the pecking order, and that can get noisy, not to mention uncomfortable for the birds. It’s best to have a minimum of three hens so they can keep each other company. This time of the year is perfect to plan what size flock you want, where you want their coop, and what breed of chicken you want. You can check out these earlier posts on some basics of chicken coops and care, and the breeds I have right now. What breed should you have? I can hear you asking; you mean there are different breeds of chickens? There are actually hundreds of chicken breeds! Check out the wiki list for an overview. But which breeds are going to best for you, a new chicken farmer? Here are some suggestions for your consideration; these breeds are generally easy-going, hardy, and readily available. Pretty gold ladies with mellow temperaments, often described as calm and friendly. They are excellent egg producers, and lay light pinkish-brown eggs. Buff Orps are heavy-bodied birds, that can tolerate colder climates. They are considered dual purpose (eggs and meat) if you are inclined that way, but to be honest, egg-layers are tough and stringy after a year and take a lot of cooking. Buff Orpingtons will likely be available at your local feed store (if they carry chicks) come spring. Wyandottes come in a variety of color schemes; gold, silver, blue, to name a few. Like the Buff Orpington, Wyandottes are heavy-bodied birds with an easy-going nature who are also very good egg producers. You can expect about 4 brown eggs a week from one of these girls. Wyandottes are hardy in cold weather. These birds do it all. They are excellent egg-layers (some report 6 or 7 eggs a week), hardy in winter and heavy bodied. They are even the state bird of Rhode Island! Most report mild and friendly temperament in these birds, although my two girls were the dominant birds in my first flock and were on the bossy side. That’s okay, every flock needs a leader! For a first time owner, 3 or 4 Rhode Island Reds will provide you with more than enough eggs for you and your family. Have you kept chickens? What are your favorite breeds? What birds would you pick for your flock? Would you want a variety or keep all the same breed? Good luck, and be sure to check back for more chicken, garden and animal training tips! I was tagged by WANA buddy and God of Thunder Tour Promoter for Thor, Debra Kristi, in the 7-7-7 Game. Thanks, Debra! She rocks as writer: Debra will make you laugh, make you cry, make you think. Make sure you check out her terrific blog, Sparks in the Fire, and follow the adventures of Thor as he tours the Earth. He’ll be making another pass through the Evergreen State shortly. I’m preparing my household now for the Asgardian’s visit. “Lo siento, senorita, but I work nights and need to sleep all day. I can’t.” He shrugged, and looked away. “Unless you can pay more than my job now.” He hinted. Lily couldn’t, and embarrassed she held her persuasions. He shook his head, again. “Lo siento.” He repeated. Lily was grateful he stuck around to help the rest of the day. The herd was in frightful shape, physically, emotionally and metaphysically. When they finished up that first day, Lily had no time to work on the heavy energies weighing the horses down. She activated every ward she had on the barn and even called in a couple of astral allies to guard the injured horses when she crawled under the covers that first night. Caring for the desperately wounded horses, shielding them psychically and magically took it’s toll on Lily. Their medical care was intense, and Lily could not even begin to disable the dark energies clinging to the herd. She could only continue to keep them shielded and the strain was draining her rapidly. She slept in the barn in short bursts, when she could sleep. Lily had no idea how she was going to fix this. That’s a few more than 7 lines, I know. Always give more, that’s my motto. Speaking of more…I was listening to past shows of Coast To Coast AM recently, and the geneticist who says she has isolated Bigfoot DNA was the guest. I wrote about Bigfoot recently, and mentioned the press release from this woman’s company. I said in that post that I was reserving judgement until I saw the data published in a peer-reviewed journal. I figured that was the last I’d hear of it. I was wrong. The show aired on December 23, 2012, and it was a real eye-opener to listen to this woman speak. Dr. Melba S. Ketchum is no lightweight. She is a veterinarian, a genetics researcher and she founded a company called DNA Diagnostics in 1985 that offers services in human and animal forensics, paternity testing and disease diagnostics to name just a few. In the interview, she stated categorically that she was not a believer in Bigfoot before she began this project. She also said that this discovery has caused such traumatic upheaval in her life that, when host George Knapp asked her “if she had the choice, would she do it again” her “No!” was immediate. In her opinion, her proof is conclusive, she has isolated the genome of a previously unknown human hybrid. That the mitochondrial DNA is unquestionably of modern humans, and that there are DNA segments that are unknown to any current database. She states these are a tribe of humans, that they should be immediately protected, and all ‘Bigfoot hunts’ should be stopped. Needless to say, she has irritated a large body of Bigfoot researchers whose bread and butter relies on hunting Sasquatch. Not everyone, it seems, is thrilled with her research or her statements. She could not describe her research protocols, or give a lot of details because her paper is currently under review for publication. She was fully confident in the paper being accepted, but did qualify that if it was not, she would publish the data publicly. I was persuaded by her testimony. Don’t let me sway you though. Listen for yourself. Skip to minute 41 for the Dr. Ketchum’s interview. The first hour is interesting, but unrelated to this topic. It’s over 2 hours long, but it if you interested in Bigfoot, you’ll enjoy this. Put it on in the background while you’re cooking dinner or doing dishes, that’s how I listen. Then come back and let me know what you think. In my dolphin post, I shared a video of a cat interacting with dolphins. It was such an Awwww moment, I thought I’d share a few more with you. I give you….Dog and Owl. And my personal favorite, Dog and Elephant. Looks like Dog isn’t just Man’s Best Friend. Do any of your dogs have unusual animal buddies? Wild Wednesday – Go Batty! Short and sweet this week folks. I found this video a while ago, and just love it! Lil’ Drac is a short-tailed fruit bat abandoned by his mom and raised by the folks at Bat World Sanctuary in Texas. Why bats? Aren’t they icky, scary bloodsuckers? On the contrary, they pollinate and eat bugs. If you have bats in your area you can thank them for helping keep the insect populations in check. Go ahead and enjoy those bananas, mangoes and guava, all pollinated by bats. This quickly became one of my favorite memes on Facebook. I love bats! I always wanted to have one as an education animal when I worked at the Zoo, but it never happened. So, I am content to enjoy them from afar, and ask Hub to build us a bat house. What’s a bat house? Why would you want one? A bat house provides a safe place for bats to roost and sleep. With increased habitat loss, bat populations are in trouble. You can provide a safe home for bats on your property, keep them from roosting inside your house and under your eaves, and reap the benefits of their insect control. Check out why we need bats, and why bat houses are a great idea here. Go on, put up a bat house. Go Batty! Weird Weekend – Bigfoot, Hoax Or Real Deal? Ah, Bigfoot. One of the trifecta of cryptids that also includes the Loch Ness Monster and the Yeti. Remember the Patterson film that surfaced in 1967? A large lumbering ape-like creature filmed by two men out on horseback in Northern California had been praised and vilified. Is it a hoax? Is it real? Both men involved consistently claimed it was not a hoax, but many have come forward since saying they wore a suit and faked the Patterson film. Others, such as the Bigfoot Field Researchers Organization maintain that this is a legitimate film showing an actual Bigfoot. Real or fake? A flesh and blood organism, a large mammalian species that has thus far gone undiscovered in North America? Sightings continue to this day, as you can see in the two following videos. Some of them even make it to the evening news. Naturally, some are manufactured, deliberate hoaxes, as was the case in Montana when a man put on a Ghillie suit (a type of camouflage), to try and get people to call in and report Sasquatch sightings. Sadly, that hoaxer met a tragic end when he was struck twice and killed by cars while crossing a highway. The biggest factor brought up by the naysayers is the lack of hard evidence. The blurry photos and videos, the absence of physical trace seem to point to an absence of an actual animal. Or do they? Is there any physical evidence that has not hit the mainstream media? Researchers in Texas say they have sequenced Bigfoot DNA from “purported Bigfoot samples.” They claim that the DNA proves Bigfoot is a heretofore unknown species that is a “a human hybrid with unambiguously modern human maternal ancestry.” Wow. Take that one in for a moment, and ponder if we can prove that one cryptid is real, what does that say about the rest? I encourage you to read the report I found, here. It’s not a scholarly article, still waiting to see that, but nonetheless, it is food for thought. Have you seen a Bigfoot? Heard one hollering in the woods while you were camping? I haven’t, but a good friend tells how she and another friend listened to one howling on a mountainside while they were camping a few years ago. These were experienced campers, and outdoor enthusiasts and both said it was like nothing they’d ever heard before. OK, I’m tossing you a softball here. Who out there remembers Flipper? Who’s been to Sea World? Does anyone not love the bottlenose dolphin? When people say ‘dolphin’ this is the animal most of us immediately see in out head, but the bottlenose dolphin is only one of almost 40 species within the family Delphinidae. The Delphinid family also includes killer whales, Pacific whitesided dolphins, and spinner dolphins. The bottlenose dolphin is the one we pet and feed at Sea World, the one who does the bulk of performing in dolphin shows and in the movies. Lots and lots of lore and legends surround the dolphin, going back to ancient times. In Greek mythology the dolphin is linked to the god Apollo, and his temple at Delphi, but also Dionysus, god of wine and revelry. Maybe that’s why dolphins are always smiling and look like they’re having so much fun? The Greek myth of Arion tells of dolphins rescuing this famous singer from drowning. You can read about this legend and more here. Today, dolphins have a reputation for being intelligent. New Agers claim they are smarter than us and here to help the us and the planet. You can find dolphin swim programs all around, just Google it. Wherever there is warm water and tropical resorts, you are likely to find companies that either have dolphins on site or will take you out to them in their native habitat so you can swim with dolphins. Who’s in? I know I would be the first to jump in and play. One of the most enduring legends about dolphins is their capacity to play and make friends. I think these two short videos say it all. Doesn’t that look like fun? This one though, always warms my heart. But how smart are dolphins, really? If you measure it by the things dolphins have made, then not very bright at all. However, put a human and a dolphin in murky water and ask them to find objects on the bottom or even floating around and the human will look like a floundering idiot. Current research shows that dolphins give themselves names, called signature whistles, that they develop when they are infants. Dolphins will use these to get the attention of other dolphins in their social group, or to find each other in murky waters. Is this language? Research done by Louis Herman in Hawaii shows that dolphins do possess the ability to understand word order, as shown in this really cool video. Let’s see…swim and play all day with your best buddies? Yeah, next life I think I want to be a dolphin. What would you be if you could choose? Hub and I went on a Ghost Tour last weekend. I love that sort of thing, and his daughter gave us a gift certificate for the tour for Christmas. We were lucky it wasn’t raining, but cold and foggy, which gave the perfect atmosphere. Just the history part made the tour worthwhile, but we made multiple stops at various famous downtown Seattle landmarks. Like the Smith Tower. Security guards tell of hearing furniture being dragged across floors above them, even in rooms where there is no furniture. Shadows are seen flitting across monitor screens, security cameras catching movement on supposedly unoccupied floors. In both cases, when the guards investigate, no one is on the floor. We went into the lower level of the Merchant’s Cafe, the oldest restaurant in Seattle. I immediately felt the presence of many spirits, especially in the bar area and the bathroom. I saw a lady, dressed in vintage clothing stroll down the hall to disappear into the bathroom. I followed, snapping pictures, then returned to hear the tour guide saying how a woman is often seen going into the bathroom. I wanted to say, ‘Yes, I know’ but kept quiet. The bathroom pics were not that impressive, although a faint orb is visible in one. I had better luck with the bar. I got a few funny looks from others on the tour, but I whispered to the spirits that I knew they were there, and I was going to take some pictures. If they would like to appear in the pictures, that would be much appreciated. I took two pictures with nothing, then got this one. I know. Dust motes, it’s the quickest and easiest explanation. Hub cleaned the lens thoroughly before we left for the tour, and it was closed unless I had it out taking pics. I did get quite a lot of orb pictures, actually, and they are never in the exact same spot, so I’m quite sure it’s nothing on the lens itself. I know. It doesn’t preclude floating motes in the air. With the three orbs in the picture above, I’m not 100% convinced they have a spectral origin. These next two though, I’m pretty sure I captured the spirits who inhabit these portions of underground Seattle. They are so bright and shiny, and I was actively communicating with the spirits in these locations at the time. The only alteration I have made to these two pictures is to crop them to zoom in on the orbs. The bar picture is completely untouched. This was only my second time actively trying to communicate with spirits and capture it digitally. I’ve had great luck so far and I’m looking forward to sharing them with you. While nothing overt happened to Hub or I on the tour, I did make contact with several of the ghosts in the locations we visited. Including the one that followed us home. Stay tuned for that story! My next time out, I’m going to try and capture some EVP’s. What ever I get, I’ll be sure and share. Happy New Year! New beginnings, new possibilities, new horizons to seek are all awaiting us in 2013. This is the time of year when people make resolutions, plan to break bad habits and form good ones, and reconnect with friends and family. My wish for everyone on the planet is this: May 2013 be the year that brings you all the love, prosperity and abundance you desire. But we didn’t get here all at once. It was a long journey through all of 2012; the joys and sorrows of the past year are part of us, and it is up to us to take in those lessons, the bitter and the sweet, learn from them and move on. Take your pain, bless it, thank it for its teachings, and let it go. Take your joys, embrace them, tell yourself that prosperity/love/abundance is your true destiny and desire, and manifest that for the coming year. You can do it! Every journey starts with a single step. Today is the first step of your new life. Seize it! To help you on your road, I want to introduce you to two animals that make incredible journeys in a single year. Let them inspire you, that you too can accomplish much and travel far in 365 days. Humpback whales make the longest migration of any mammal on the planet; 5,160 miles traveling from the frigid waters surround Antarctica to the balmy Caribbean. Think you’ve had a long year? Try swimming from the pole to the equator and back again. 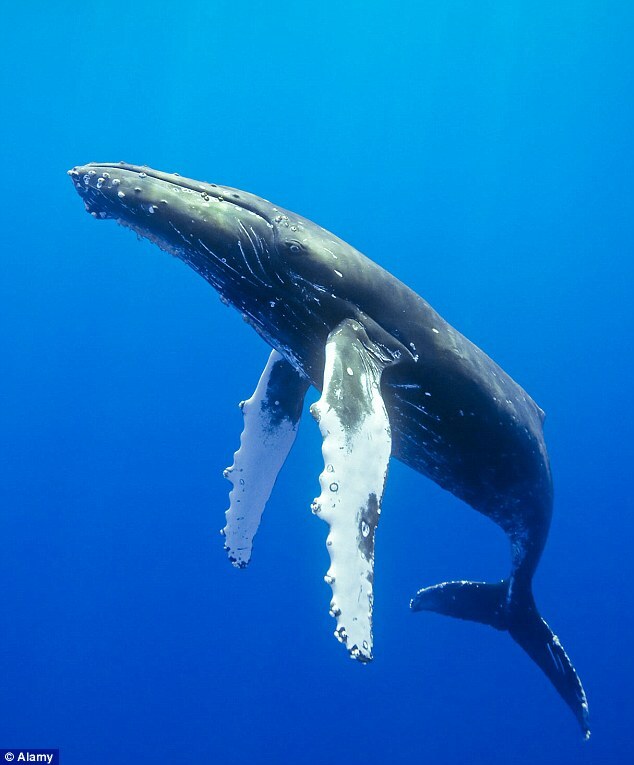 Humpback whales are found in all the oceans, and they regularly migrate from cold Arctic or Antarctic feeding grounds to warm equatorial waters to bear their young. Humpback whales are baleen whales. All cetaceans, the animal group that includes whales, dolphins and porpoises, are divided into two groups, baleen whales and toothed whales. Baleen whales strain very small fish and other organisms from the water using thick, fibrous plates called baleen. These baleen plates hang from their upper jaws like curtains, and the skin and muscles of their lower jaws expand tremendously to take in huge quantities of water and food. The water is pushed out with the tongue and the little critters in the water are trapped by the baleen and eaten. It’s not just their travels that make the humpback unique, look at those long front flippers. Oh yeah, and they are flippers NOT fins, here’s the difference; flippers have bones and fins do not. No other whale has elongated, wing-like pectoral flippers, making the humpback whale instantly recognizable. What really makes me love the humpback? They sing. Just like my own Hubby making up songs to delight me, humpback males sing long, complex, beautifully haunting melodies to entice the ladies. Here’s the really amazing part, all whales sing the same song. It changes year to year, but every whale makes the same changes in a year. It’s still a mystery how they communicate the changes to each other. I figure if all the humpbacks in an ocean can manage to get their act together each year and all decide on the new song, I should be able to step it up and make the goal of being better at networking and growing as a writer. This tiny, 4-ounce bird makes the longest migration of any animal on the planet. They have the humpback beat by a whole hemisphere. Arctic terns migrate from Greenland to Antarctica, traveling 44, 000 miles one way. These birds have a life span of up to 30 years, and scientists estimate in that time they travel 1.5 million miles. Let me give you a little perspective on that number; in its lifetime, an Arctic tern will travel the equivalent of to the moon and back three times. I will never again complain about my commute. On the upside, they never see winter. Their travels take them from northern summer to southern summer. How far would you travel to always have long, warm summer days? Arctic terns mate for life. Talk about commitment: “Honey, it’s time to pack up the kids and head to Antarctica.” It must be true love. How far would you go for what you love? From one pole to another? We are all on this life journey together. Many small steps taken one at a time can carry you incredible distances. What commitments do you need to make for your journey? What is your first step? How far will you go?